Dr. Sushma Bhadauria, MD, MS, FACOG, is a Board-Certified Obstetrician Gynecologist and an Attending Physician at Cedars Sinai Medical Center. She has over 15 years of experience in this specialty, including being a faculty at UCLA in the Department of Ob-Gyn and as a staff obstetrician and gynecologist at Cedars Sinai Medical Group. Dr. Bhadauria completed her four year residency training in Obstetrics and Gynecology at UCLA and Robert Wood Johnson Medical Center. She worked as an Assistant Professor in the Department of Obstetrics and Gynecology at David Geffen School of Medicine at UCLA and in 2006 she joined Cedars Sinai Medical Group as a staff obstetrician and gynecologist. She worked there until January 2014, when she started her own private practice located just a mile away from Cedars Sinai Medical Center.Dr. Bhadauria is currently accepting new patients. Dr. Bhadauria continues to perform surgery, deliver babies, and participate in resident education at Cedars Sinai Medical Center. She has received many honors and awards for her excellent teaching and patient care including UCLA Medical Student's Ob-Gyn Teaching Award, Olive View/UCLA Education Research Institute grant award, and the Golden Apple Award from the Cedars Sinai Medical Center. Her research has been published in several national and international journals including American Journal of Obstetrics and Gynecology, Gynecology Oncology, and International Surgery. Dr. Bhadauria also published research on ultrasound evaluation of high-risk pregnancies and acquired surgical skills during her three-year Master of Surgery (M.S.) in Obstetrics and Gynecology that she obtained after completing her medical school and medical internship from Sarojani Naidu Medical College, Agra, where she received Certificates of Honor in several subjects including Ob/Gyn and Internal Medicine. 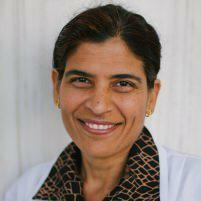 She held several leadership positions including Director of the Continuing Medical Education (CME). Dr. Bhadauria delivered a baby still inside amniotic sac, at Cedars-Sinai. The baby was born prematurely, by C-Section, at just 26 weeks with the amniotic sac still intact: a true medical rarity. Mom and baby are doing great! Click here to watch the CBS News clip! Our goal is to provide you with the highest quality compassionate and individualized OB-GYN care, making every experience extraordinary, unique, and tailored to your personal and cultural needs. We combine our extensive experience in obstetrics and gynecology, sound clinical judgment, and strong surgical skills with warm bedside manners.